You may be able to see a bit of theme here, between Lavender and Focaccia what with Lavender Macaroons and Blackberry Focaccia having already made it to the blog. I was determined this summer to make good use of our Lavender and I’m trying to build myself up to going grain free again, so I need to get bread out of my system, though I love it so much that will be tricky. 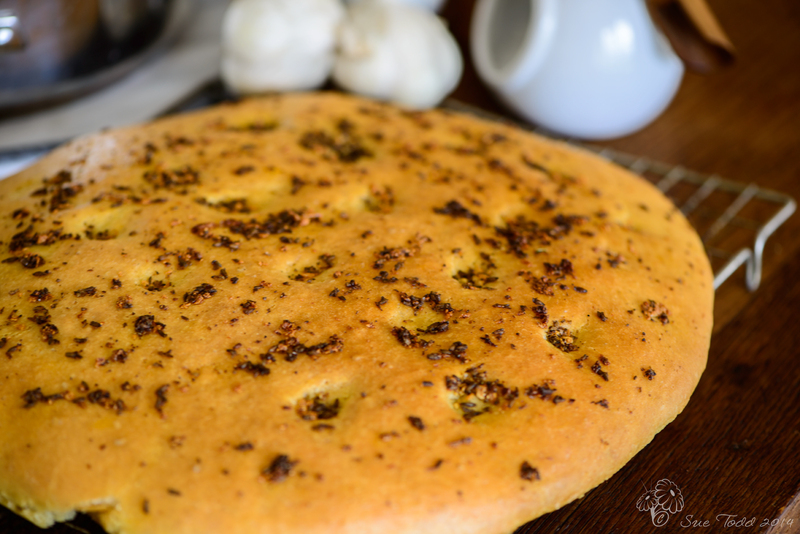 I was searching for Lavender recipes when I came across one for lavender focaccia and thought it had to be tried. This is my interpretation of the recipe from What’s Cooking America : http://whatscookingamerica.net/Bread/LavenderFocaccia.htm with English measurements and a few little changes. Not being one for eating flowers I was a bit dubious about this one. This was my first attempt at cooking with lavender and to be honest I wasn’t sure what to expect, however, it made for a wonderful surprise and its a bread I’ll be making again and again. We ate it for lunch with Gary’s shin of beef with fennel and Chianti and it was a perfect match. You can mix and knead the ingredients by hand if you wish, but I like to use my Kitchen Aid, it does a far better job of that first round than I do. Add the flour to your mixing bowl, followed by the salt, honey, and olive oil. Switch the Kitchen Aid to a low speed like 2, and begin to add the water. If you are doing this by hand, make a well in the centre of your bowl before starting to add water. Keep mixing and adding water until it forms a dough. I find that depending on the flour you sometimes need a bit less or a bit more water, just keep an eye on it and aim for a nice soft dough that comes away from the bowl cleanly. At this point either leave your stand mixer to knead the dough for about 10 minutes OR tip the dough out on to your work surface and knead by hand. If the dough sticks to your hands add more flour, a little at a time. With the stand mixer if the mix is too dry add a little more water, if its too wet then add a little more flour. The dough should be really smooth. Once you’ve finished kneading the dough needs to go into an oiled bowl to rise. This is the point where I juggle the dough in one hand while oiling the mixing bowl with the other so as to re-use the mixing bowl and save washing up. Shape the dough into a smooth round and pop it into the oiled bowl. If you are using a mixer you can manage this shaping in your hands without needing to clean up the work surface later. Cover the bowl with a clean tea towel and pop the bowl in a warm place for the dough to rise. You can use cling film but it doesn’t feel very eco-friendly to do that somehow, because it’s not like you are going to wash and re-use it, unlike the towel. The back of the AGA plate is ideal. Leave to rise until doubled in size. Time here will vary depending on how warm it is and if your yeast is good or getting old. If you use dried yeast and have had it some time it may not work as well. While its rising lightly oil a large baking sheet ready for your loaf. A conventional oven will need to be preheated to 400F/200C or Gas Mark 6. With the AGA it wants to go in the baking oven of the four oven version. I can’t advise on the two oven AGA as the only one I’ve ever had the misfortune to use didn’t work often or well – through no fault of AGA I hasten to add, I managed to cook very little in that one. Once your dough has doubled in size, lightly flour your work surface and knock the dough back gently before rolling it into a large rectangle. Transfer the dough gently to the oiled baking sheet, cover with a clean tea towel and let rise approximately 30 to 45 minutes or until it doubles in size once again. You can make this topping while your dough is rising. Chop your lavender finely and mix it in a bowl with the garlic and the remaining olive oil, then set it to one side while you wait for the bread to rise. Once your bread has risen for the second time, make little dimples in the dough with your fingers, then brush the topping all over the surface of the bread and into the dimples you’ve just made. Finish it off by sprinkling coarse salt and pepper on top. Bake for 30 to 35 minutes or until golden brown. The bread should be firm. Remove from oven and transfer to wire rack to cool, before eating. Enjoy! If you try it I’d be interested to hear what you think. 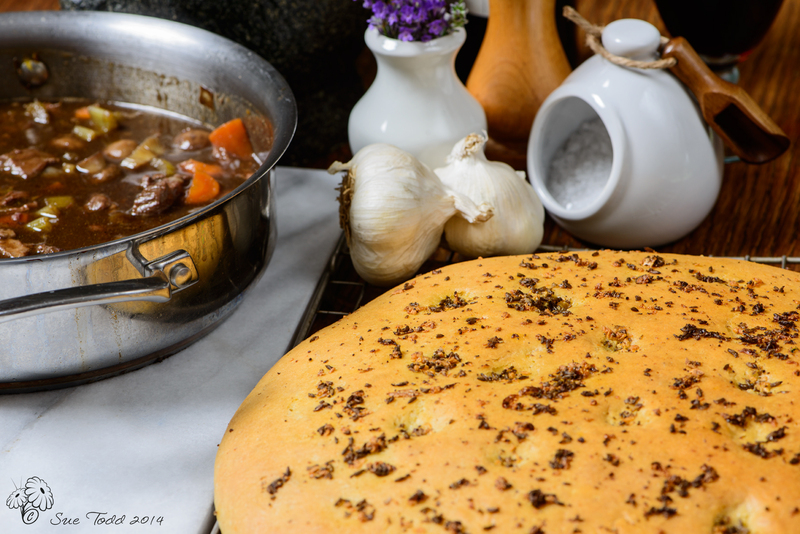 This entry was posted in Breads, Recipes and tagged Bread, Focaccia, Lavender on September 16, 2014 by Sue Todd.